Garage demolition is an underrated service in today's demolition market. We at Beaumont Demolition proudly provide garage demolition services to Beaumont, Port Arthur, Lake Charles, Nederland, Orange, Vidor, Lumberton, Sour Lake, China, and Silsbee, Texas and the surrounding areas. Why is garage demolition underrated? Well, most people don't want to face the reality that it's time to say goodbye to a creaky and old garage. In reality, it’s a safety hazard and drives down the value of your property. 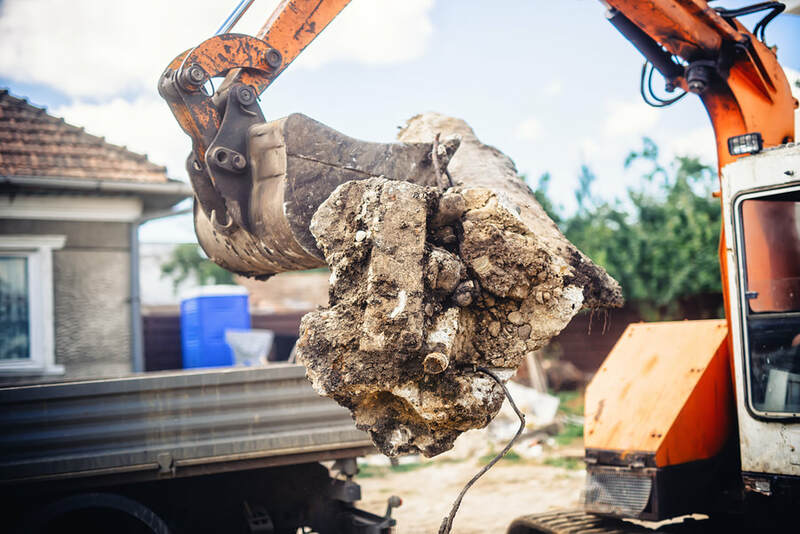 Irreparably cracked garage slabs, finicky and perpetually shifty and inoperable doors, and other issues are indications that garage demolition is the proper solution. We offer this service at affordable prices that best the competition. Before doing the demo work, our team at Beaumont Demolition is pleased to provide you with removal services. Garages, sheds, and other freestanding structures have a tendency to accumulate worthless junk. Disposing of everything in there is a daunting proposition. We are happy to help. Our crew can remove old furniture, stoves and appliances, mattresses, pianos, beds, TVs, fencing, or whatever else you have stowed away out of sight. We've seen the messiest garages there are, so rest assured that we are prepared to handle cleanout of ours. We properly dispose of all hazardous material and recycle or donate any items that can be reused. For obvious reasons, freestanding garages are the most common type of garage to be demolished. While the natural temptation is to repair your garage, there are particular signs and symptoms of when its time to completely demolish it. That's where our team of certified demo pros comes in. Decrepit, crumbling structures often cannot be sufficiently repaired. Patchwork does not constitute a permanent solution. If your freestanding garage is in a permanently deteriorating state, it is not only a safety hazard but also constitutes a need for a need garage. Contact us at Beaumont Demolition to get the job done the right way for you. Other freestanding structures are similar to garages in that on occasion they need to be replaced in their entirety. Sheds, barns, and other freestanding structures fit this bill. Our certified demo pros have the knowhow to safely demolish any free standing structure. Freestanding structures are like mini-houses and need to be maintained as such. That's why decrepit sheds and barns need to be demolished from time to time as repairs become a hopeless proposition. You need a permanent solution to freestanding sheds and barns which are falling apart. We at Beaumont Demolition provide exactly that and do the job more affordably and efficiently than the competition. If you need garage demolition services, contact Beaumont Demolition today for a fee estimate. Costs depend on several factors, such as the location, size, and material of your garage or other freestanding structure. Our local company is dedicated to providing the highest quality service at affordable prices. The existence or non-existence of hazardous materials also affects the price. Generally, demolition of garages and other freestanding structures rangers fro $2.00 to $6.00 per square foot. There is also the scope of the project to consider and the required permits. Our team has the savviness to secure any necessary permit for any demolition project, including garages.